Jayadeva Goswami is the author of the Gita-govinda, a poem about the pastimes of Sri Sri Radha-Krishna. He appeared 300 years before the advent of Chaitanya Mahaprabhu. 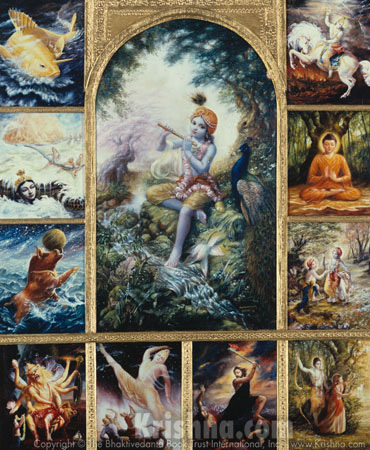 Lord Chaitanya relished hearing the Gita-govinda sung by His close associates. To this day the poem is recited daily in the temple of Lord Jagannatha in Jagannatha Puri, Orissa. Jayadeva Goswami is also the author of the famed Dashavatara Stotra. "O Keshava! O Lord of the universe! O Lord Hari, who have assumed the form of half-man, half-lion! All glories to You! Just as one can easily crush a wasp between one's fingernails, so in the same way the body of the wasplike demon Hiranyakashipu has been ripped apart by the wonderful pointed nails on Your beautiful Lotus hands."